But I wasn't aware that our new home outside of Iloilo was called "The City of Love" until I saw that banner. 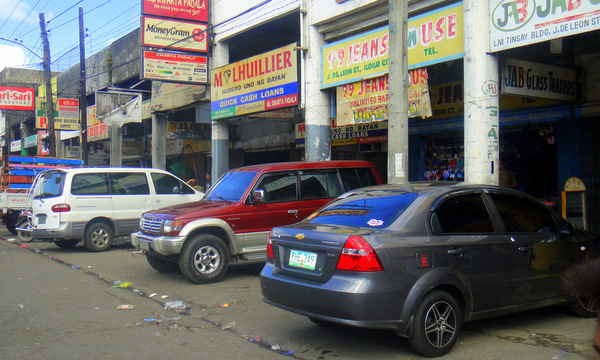 When I first spied it I thought it was referring to the proliferation of drive-in motels scatttered throughout Iloilo. So I decided to drag out some photos I took from the back of a jeepney as my asawa and I returned home after visiting Robinsons in downtown Iloilo a few weeks ago. Hopefully, the pictures will give you a little flavor of what it's like to travel through this bustling metropolis. Don't cringe. I know how I hated it as a kid when we went to Uncle Gene's house, and he would show us the latest vacation pics on his slide projector. I promise to make this as painless as possible. All the air con you can want at this barber shop. But if you want more privacy, head out to a Ricky Reyes' Salon and pay five times as much. 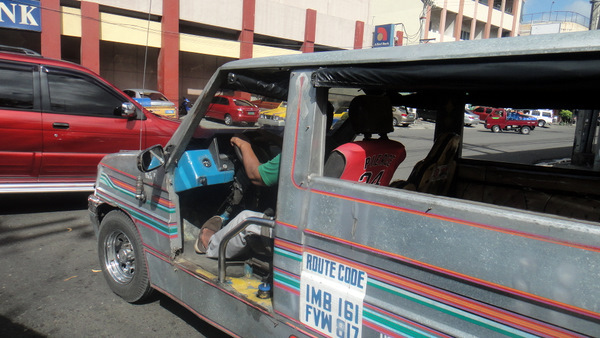 Here's a close-up of a nearby jeepney driver trying to "t-bone" a van at an intersection. 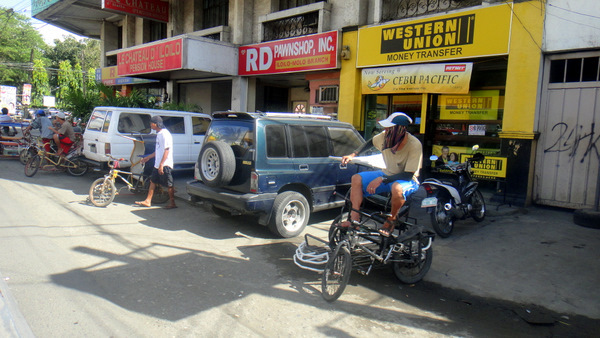 Just part of the "combat driving" scene in the Philippines. Here's a shot of some of the local businesses that can be seen along the way. 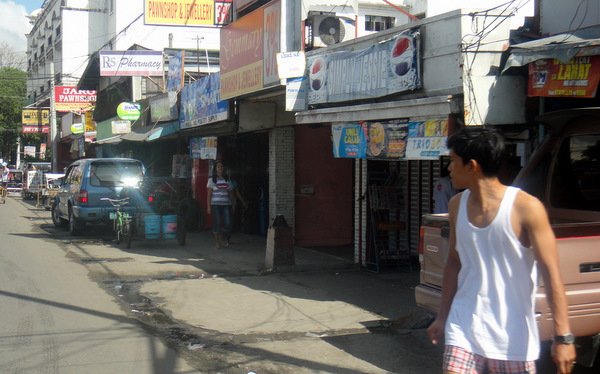 "Gritty" is the way I describe a lot of downtown Iloilo City. Crossing the street in downtown Iloilo City is always an adventure. You always hope and pray that the jeepneys will stop for you. 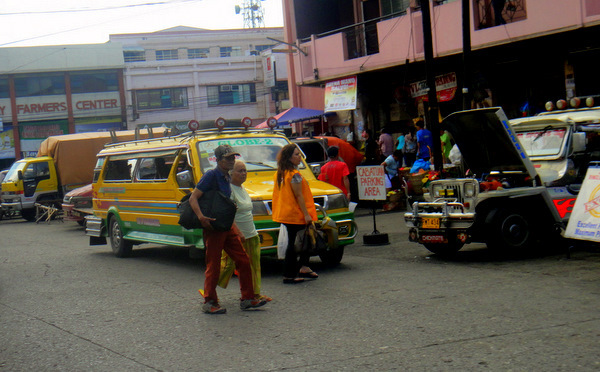 Here's a Filipina waiting for a jeepney in downtown Iloilo City. Note that she is wearing extremely tight-fitting jeans. You will see that a lot in the Philippines. How in the world some of these ladies get into these jeans is beyond my comprehension. I find my own waist size expanding the older I get. 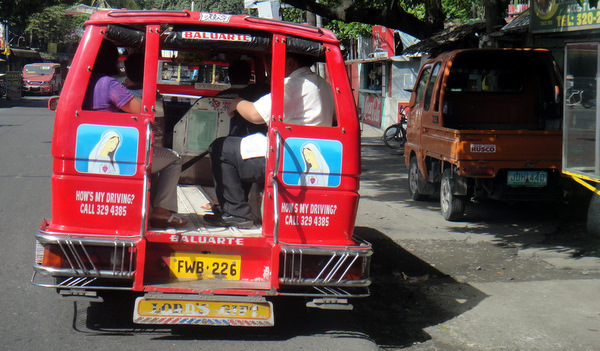 Here's a good shot of the rear of a jeepney. If you think it's difficult for a 6' 200 lb. kano to get on and off these things, you're right. But I manage. It's inexpensive transportation. That's why I refer to these vehicles as "cheapney's." Here's a young Filipino guy glancing back at "Super Girl." Either he's checking her out, or she's a girlfriend that discovered some other cute Filipinas he's been chatting with on Facebook. And I leave with you with one final picture, because I see the pretty pinay drinking a Coke displayed on this sign all over Iloilo City. And to be honest with you, just like the tight-fitting jeans on cute Filipinas (including my own asawa), I don't mind seeing this image either. Iloilo City. The City of Love. Where the people are friendly and loving. A great place to live! A great place to visit! 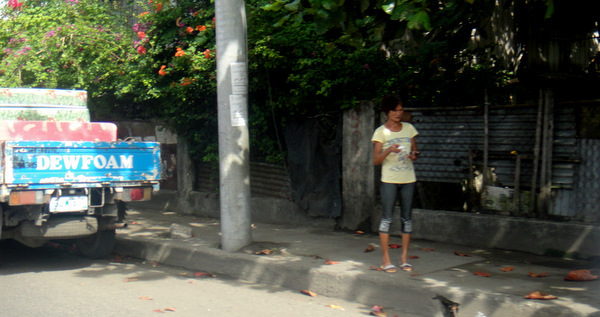 ← Aswang Attacks Cop Outside Our Iloilo Subdivision! Hi Dave, yeah, you’re right, Iloilo City is often called City of Love. Thanks for the pictures, I really miss Iloilo. If I am only wealthy here in U.S. I will go home to Iloilo once a year. Sadly, I am not. I still save and try to go home at least once every 3 years. I grew up in Iloilo and plan to retire their someday. Then we’ll be neighbor Dave. Godspeed. It’s quite expensive to fly back and forth from the States to the Philippines, Reynaldo. My wife and I only made it over once in the nine years she spent in America before we moved to Guimaras in July 2009. Glad you liked the pictures and look forward to being your neighbor in the future. Take care. Oh I miss Iloilo, for someone who’s haven’t been home for long time, this is the next best thing to being there. 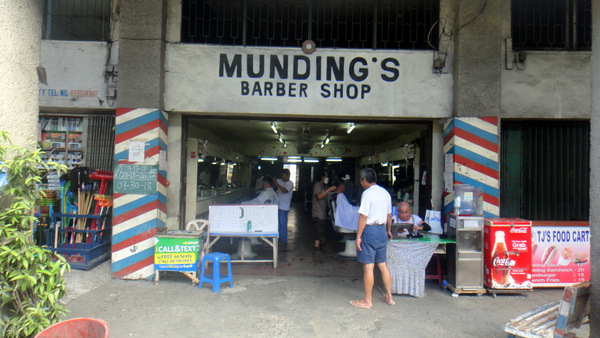 The picture of Mundings Barber shop cracked me up, I can still remember vividly, 25 years ago when I decided to have a haircut for my ROTC, the favorite barber. was not around so I decided to try somebody else, – bad decision. The haircut was so bad that I kept glancing around, “now what?” I don’t have a hat with me that time to cover the devastation – Oh well uglyd or not I’m going home. can share with my asawa (who’s also an Ilongga) and my American Friends. Thanks so much for your kind words, Ramon. Your amusing story about the haircut reminded me of the time I got a perm at a clip joint called the “OK Corral.” It was a total disaster! I rushed into my car hoping no one would see me. Got home, got my cap and rushed out to by some stuff that would de-frizz me. Didn’t work that well. Took awhile for my hair to recover. I looked like Richard Simmons for a LONG time after that. Thanks, Jonathan. Very good description of Iloilo. Absolutely not as chaotic as Manila but like you remarked, it has that “province ambience.” I just love it here. And that hot dog stand? Yeah, that cracked me up. I’m afraid it’s selling those bright red dogs I can’t stomach even though the stand has that “Uncle Sam” character slapped on it. 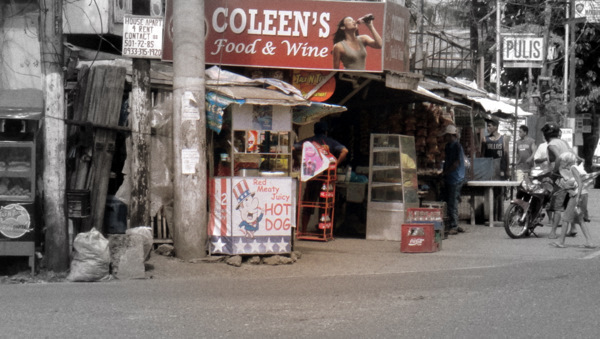 My hot dog of choice in the Philippines? Pure Food franks. Six pack for P160. I’m even buying their turkey franks now, and they’re really tasty. Isn’t it that Purefoods is synonymous to the dreaded red hotdogs? Or maybe, the vendor is using a different brand, maybe Swift’s or CDO’s, or who-knows-what? Well, those are cheaper heheheh and better for business use. I’ll have to check out that stand sometime, Jonathan. My wife fried up some hot dogs for me in January 2000, just days after we got married (we got hitched in the Philippines.) I could only stomach 1/4″ piece of the hot dog. At least the Pure Foods brand I buy now has the same color casing I’m used to back in the States, and also has a decent blend of spices that I like. What’s inside the frankfurters? I don’t want to know. Ignorance is bliss. Good photos of Iloilo. Just found out my G/F has lived there in the past. Would love to go back there again. So there’s a good chance we’ll be heading your way. She has a whole laundry list of places to go. Have a nice day. Thanks Papa Duck, would love to have your G/F and yourself stop by for a visit. Really friendly folks, interesting places to see, and Guimaras is just a pump boat ride away where beautiful white sandy beaches can be found. Great photo tour of the city! I’ll be “home” in the Phils. next week! Can’t wait! I must learn to “see” my surroundings through the eye of the camera, like you. That way I can entertain my friends, the way you entertain us through this blog. “Gritty” is a perfect term to describe the urban environment in our province, too. Have a safe trip, Ice Man. Be prepared for those wolf whistles like our friend Tom Ramberg gets in GenSan. And a camera is a must. So many great photo ops here. Take care. Tourists beware! This is Iloilo! I thought it was an ominous sign, but never had any trouble and did stay at the Eros guesthouse for a couple of nights. Yeah, that’s not the kind of greeting you like to see when you arrive in a new place, Rob. Never have had any trouble, either, lots of friendly folks here. I wouldn’t recommend hanging out by yourself wandering the streets or downtown area at night alone, but there’s lots of places back in the States where I wouldn’t do that either. Great place to visit. Great place to live. Iloilo. You’re welcome, David. Have a safe trip. Looking forward to meeting you.